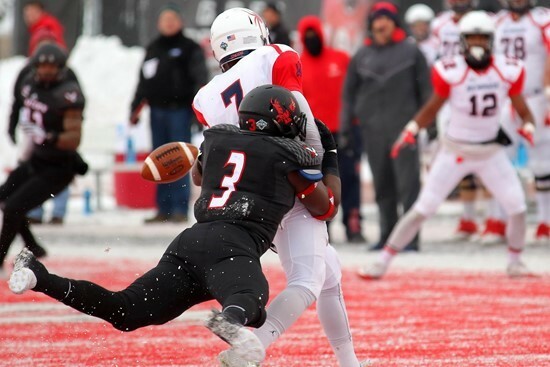 CHENEY, WA – Up 7, with a 4th and 1 at the Eastern Washington 3 yard line, Richmond head coach Danny Rocco, wearing an uncharacteristic hat on a characteristically cold, snowy, and frigid day on the red turf at Roos field, decided to go for it. He knew that his offense was struggling to get anything going in the first quarter against Eastern Washington, and he’d already turned over the ball once in these cold, unfamiliar conditions. He knew that if he could get that first down against the Eagles, he’d have a shot at his Spiders making this FCS playoff game into a shootout. But instead, quarterback Kevin Johnson was greeted by Eagle defensive back J. J. Njoku, for an enormous 14 yard sack to turn over the ball on downs. It would be the closest Richmond would get to the end zone all afternoon. The Eastern Washington offense, helmed by quarterback Gage Gubrud, had his typical great day – 287 yards passing, and 3 touchdowns, and so did one of the best receivers in all of FCS, Cooper Kupp, with 6 catches, 128 yards and 1 glorious touchdown. But it was the defense’s day, the first shutout pitched by the Eastern Washington defense since a 16-0 win over Northern Colorado in 2009. Eastern Washington’s offense held Richmond to 205 yards of total offense, notching six sacks and forcing five turnovers – four fumbles and one interception. Senior defensive end Samson Ebukam was in the center of it all with eight tackles, a pair of sacks, two other tackles for loss, a forced fumble, a fumble recovery and the game’s lone interception he returned seven yards. And the Eagle offense eagerly took the gifts from their defense, none more beautiful that Gubrud evading the Richmond defense for a near-certain safety, but was able to get free to find Kupp for a 68 yard pass play. Thanks to their dominating victory, Eastern Washington will face off against Youngstown State in the FCS Semifinals.